After we moved, Judy and I kept in touch and would see each other when I visited Woods Hole every summer. Back in central Massachusetts, with my son in daycare part-time, I continued to sew pictures, developing my fabric relief technique. I tried out different ways of making people, animals and houses with flat cardboard backs that could be sewn onto a pieced and embellished fabric background. The raised figures and props seemed to work best at a shallow depth of 1/4″ to 3/4″. “Picking Peas” (1986) and “Raking Leaves” (1987) are examples of the change in my way of working. This was a very productive time for me. Even though I was busy taking care of a child, our life was simpler and less social because we hardly knew anyone in our new town. The area was beautiful and my artwork was influenced by the agricultural landscape of our neighborhood. I started working in my studio in the evenings, a habit I’ve kept ever since. In an effort to test the illustration market for my type of work, I made a solo trip to New York City, meeting with an agent and a few children’s book editors. The agent wasn’t interested in my type of art, but I recall that one editor was intrigued. 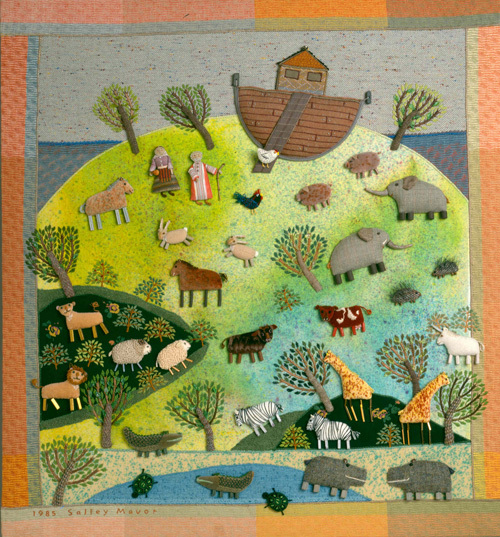 She laughed good heartily when I laid out the fabric background for “Noah’s Ark” on her desk and arranged the loose animals in front of her. I realize now that this presentation must have appeared quite unprofessional compared to the ubiquitous black portfolio with plastic sleeves that most illustrators carry. After looking at my various pieces, she told me she liked my work, but found it hard to match with a story. She suggested I find a story that I thought would work together with my style and technique. I went home feeling that I wasn’t practiced enough to take the leap from depicting one moment in a story to filling a 32-page book with enough action and visual variety to make a story come alive. I needed more time to develop my work to a point where I could confidently take on a large illustration project. After our second son Ian was born, I kept working on fabric relief pictures. I remember finishing up the “Noah’s Ark” piece on my work table, with him rocking next to me in a wind-up swing. You can see an earlier post with several pictures of “Noah’s Ark” here. I continued to make and sell fabric relief pictures, trying new ways of constructing 3-dimentional parts that could be sewn in place. After four years away, we decided to move back to Woods Hole in the fall of 1987. Judy and I soon revived our interest in The Way Home and decided to start over and change our approach to the project. I felt more prepared to illustrate the story and with Judy’s encouragement, started to think how I would make a new sample to show. We wanted to impress the editors with our serious preparation, not wanting them to see us as two inexperienced housewives from Cape Cod. I made another illustration, this time picking a more active part of the story, where the mother elephant is enjoying herself on the beach, while Savi splashes in the water. I found some plastic banana beads that were the right size and cut banana tree leaves from cloth artificial leaves. Planning ahead for the border, I bought some diagonal striped upholstery fabric, in every color available. We knew that my new and untested method of working in 3-dimensions would be questioned as a viable illustration technique. We gathered everything that we could think of to counteract any skepticism. Since my originals would have to be photographed, we had a professional 4×5 transparency taken of my sample art. We also made a storyboard showing a simple layout in the standard 32-page format. It pictured the progression of the story with the different characters at the beach, in the water, walking through the trees’ shadows, following the banana trail and looking up at the moon at the end. When we felt ready to present our project, we called and set up appointments with a handful of children’s book publishing houses in New York City. Judy was excited to be able to meet editors in person, because our visit would include showing my portfolio. Writers are asked to submit their stories by mail only. My portfolio (brown leather, not black) held the original sample illustration for The Way Home, a color print and 4×5 transparency of the sample, the storyboard, plus a collection of 8×10 color prints of my fabric relief work from the past 4 years. Judy and I drove to western Connecticut, where we stayed overnight with friends. The next morning we took the train to New York. We spent the entire day visiting children’s book editors, the most memorable being with Phyllis Larkin, an older, respected editor at MacMillan. When we were introduced and I saw her face, I knew that we had met before. I forget names, but faces make their imprint. I remembered that she was the one to whom I had shown the Noah’s Ark parts a few years earlier. Phyllis behaved as a true editor, asking to read the manuscript first before looking at my portfolio. She carefully read the story and then called in her art editor, Cecilia Yung. We laid out our visual materials and held the 4×5 transparency up to the light. They liked the pairing of Judy’s story with my artwork, but had financial concerns about the extra expense of photography. They were also upfront about their inability to offer me an advance large enough to pay for the time it would take to sew the illustrations. We left them a photograph of the sample art and a copy of the manuscript and went home. We were encouraged because they liked our idea, but didn’t know if they would take the leap to offer us a contract. Months went by and we didn’t hear from any of the editors we’d met with. Judy and I put the project in the back of our minds and were fully distracted by summer activities. To be continued in The Way Home (part 3). 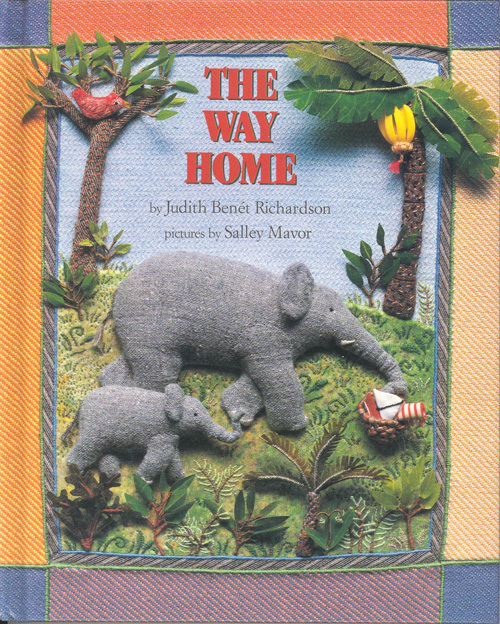 This entry was posted in Animals, Children's Books, Fabric Relief, Family, illustration, The Way Home, Woods Hole by Salley Mavor. Bookmark the permalink. I have just discovered your charming work, the fabric relief and illustration – delightful elephants! – and am completely enamoured of your fairy dolls. Looking forward to hearing the rest of The Way Home, waiting for the next thrilling installment! As ever, your work is so enchanting and it is a delight to be able to read about your journey! What a fantastic series of posts, can’t wait for the next part! This so enjoyable reading about your artistically process and progress. Your photos are wonderful. I live in CT and travel around New England and frequently visit MA. The family photos make me nostalgic for the times when my children were small and life was quieter and simpler. Woods Hole is so lovely. I love New England so I am truly enjoying reading your story and look forward to the next part. Now I am holding my breath waiting for what happens next. I’m with you all the way. This is bringing back so many memories, each marked with a project thatacts like Proust’s madeleines. I can’t get enough of your pictures. Carolyn, I’m glad that you are remembering your own journey of artistic projects. About my fingers-my grandmother taught me to use a thimble when I was a girl and I have used one ever since.